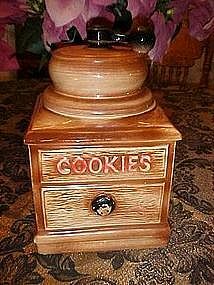 Old cookie jar in the shape of a coffee grinder, Heavy glazed ceramic with cold paint decoration. Some of the cold paint worn from the word "COOKIES" and the drawer knob. Jar is marked MCCOY USA.Measures 9 3/4" tall. The bottom is in perfect condition but the lid has a big chip (see photo).